Review: Taylor Swift - Mt Smart Stadium, November 2018. Last night, according to Taylor Swift, was her seventh time playing New Zealand. It was her first time ever in Mount Smart Stadium, and her first visit to our country in nearly five years, and the stadium packed with fans were eager to experience what Swift has been touring the world with for most of this year. Needless to say, they were not disappointed. The seven-act spectacular kicked off with ‘...Ready for It?’, an apt opening song which showcased the slick precision of both Swift and her entire on-stage entourage - with flawless choreography matching the perfect delivery of the song. Two songs in and the pyrotechnics kicked things up another level, with fireworks and flames in ‘I Did Something Bad’ creating a visual wonder. As well as the immaculate production (which ranged from 3D snakes, to a Gatsby-esque house which exploded in ‘This Is Why We Can't Have Nice Things’), Swift had several stripped-back moments in her set - at the B-Stage (which she travelled to by flying through the crowd during ‘Delicate’) she slowed things down with two acoustic songs, the latter of which was ‘Out Of The Woods’, a special song chosen for New Zealand since the music video was filmed here. Fans were treated to songs both old and new, with songs like ‘New Year’s Day’ from ‘reputation’ mashed up with selects from her enormous catalogue of older cuts like ‘Long Live’. 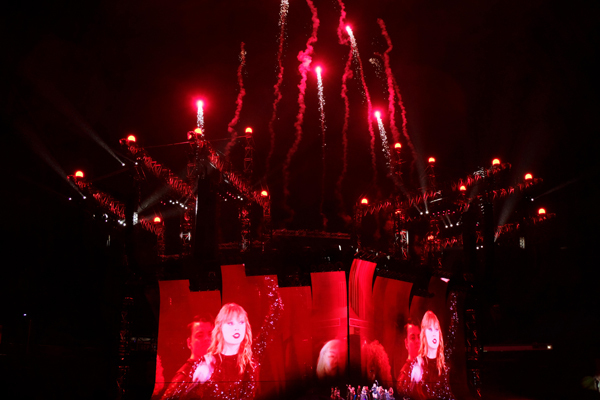 Ending the well-polished show, Swift kicked off the final act with ‘reputation’ highlight ‘Getaway Car’, matched with neon visuals over sweeping shots of landscapes, before closing out with ‘Call It What You Want’, followed by a mash-up of her classic ‘We Are Never Ever Getting Back Together’ and ‘This Is Why We Can't Have Nice Things’. For the fans who had spent hours working on their costumes to the show with friends and learning all the lyrics to every song on the set-list, the ‘reputation’ tour was a place of connection, not only with each other, but with Swift herself - something that she knows all too well, and did her best to reciprocate during the unforgettable show.